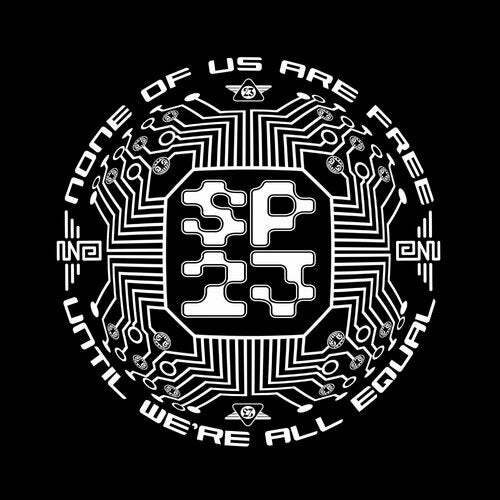 SP23 is a creative collective of musicians, DJs and artists. The origins of the collaboration goes back twenty years when the crew began a nomadic journey across Europe and beyond with the Spiral Tribe Sound System. SP23 was one of the many record label names associated with the sound systems mobile recording studio (housed in a showmans circus trailer). Today SP23 moves from strength to strength, playing packed houses all over Europe while the production crew launch a new label for 2014. The Music Aint Over is the first release from the new SP23 label. The original is by Crystal Distortion and Sirius under the name 23 Psi and is a breakneck rampage of raw warehouse rave. Two heavyweight remixes come from Charlie Kane who is second generation SP23. Born shortly after Spiral Tribe left the UK in the wake of Castlemorton, he grew up within the SP23 family and made his mark on the scene with releases on LOT49, AUX Technology, VIM and Death Proof among others. His Acid Overdrive Mix is a dark, penetrating, rolling acid groove, bursting with sensual atmospherics and industrial echoes while his 2 Steppin Ruffneck mix tears up the bad boy vibes with a dub garage rollout. Crystal Distortion is back in the zone with the Gotham Hijack Mix  psychedelic, dynamic, frenetic techno that pays homage to a harder sound SP23 helped create in Berlin in the 1990s.